As I lay down on my futon on the night before the hike, I wondered (as I often do) if I really wanted to go out and spend all day outside wandering around the mountains. I imagined the alarm dragging me kicking and screaming from my sleep, followed by a departure from the warmth of my blankets and into a day of shivering in the cold. Wouldn’t it be better to just sleep late, then spend the day with a hot cup of coffee in a shop somewhere, reading a book or maybe studying a bit on a topic of interest? As it turned out, by the time my alarm went off, I had completely forgotten about my plans for a hike, but I was also already comfortably awake and well rested, staring absently at the ceiling contemplating this and that. Suddenly I heard the sound of the alarm, and at first I thought it was time for Ivy to go to work; it took me about thirty seconds to realize that I it was for me. The negative thoughts from the previous night long gone, I got up without reservation, grabbed my bag, and headed off to Kinshicho Station. It turned out to be a beautiful, crystal clear day, though as it was about mid-February the weather was still pretty chilly, even more so because of the intermittent brisk wind. Nonetheless, it was a pleasant day and I quickly found myself shedding my coat in favor of a hoodie. It might have been just a bit too cold for only that, but for some reason as I’ve gotten older I’ve come to appreciate the sensation of cold much more than when I was younger. As a kid, I absolutely hated the cold. I would shiver away the winter months, cringing whenever I had to go outside, hunching over and shivering like a small rodent confronted with a larger carnivore. At some point, this changed. I’m not sure whether my attitude changed first and then the sensation or whether the sensation changed first and with it my attitude. All I know is that today I face cold weather with chest forward and nose high, wearing much less warm clothing than in the past and yet feeling the touch of the cold rather pleasantly rather than uncomfortably. Maybe pleasant isn’t exactly the right word — maybe appreciation is better. Being comfortable all the time drains the will to survive because in that situation survival requires no will. Feeling the cold air is like feeling the invitation of mortality, touching the edge of danger like standing on the edge of a cliff knowing you could fall. It’s just enough to remind one of the struggle for survival and awakens an awareness of one’s own limited time on this Earth — and with it the consciousness and appreciation being alive. Since I started hiking the Fureai Trail, I had been making my way through the Tokyo Sections, so I had been exclusively riding the Chuo Line out to each trailhead as that was the principle line that services western Tokyo. Now that I had finally reached Saitama, though, I finally found myself on a new line, the Seibu-Ikebukuro line, issuing from the moderately famous Ikebukuro neighborhood of Tokyo. It only took about 50 minutes to get to Saitama’s Hanno City (where I had finished last time) from there, but the bus out to the trailhead took another 50 as well, so it was a bit of a trip. Time passed quickly for me as I paged through Fukuda’s Japan’s 100 Famous Mountains, and in no time I was stepping off the bus in Little Palace Bus Stop (Kodono Basu-tei, 小殿バス停). The valley was sparsely populated, by Japanese standards at least, with a pleasant little stream running through the middle. I spotted some people having a picnic. Not far up the road from there the trail began, heading up the hillside on the right: the beginning of “The Path Visiting Musashi‘s Historic Temples.” At just under 10 kilometers long, this section is short and easy, with hardly any significantly steep sections, but also without a lot of nice views like the ones we’ve seen along previous sections. What makes this section stand out, though, is the numerous old temples along the way, adding a decidedly historic and religious flavor to the walk. Though I haven’t historically had much interest in such things, I nonetheless found myself lingering at each one, taking in all the information I could find. The way from the trailhead wasn’t steep, and in no time I reached the pass and from there descended a gentle slope. Through the trees, I glimpsed a thatched roof: I had arrived at Bamboo Temple, the first on the route. The building that I was looking down at turned out to be the Main Shrine of the Oxhead King (Gozu Tennô Honden, 牛頭天王本殿), a major deity in the pantheon of Japanese syncretic Buddhism. The building, I would later find, is actually a reconstruction dating back to only 2004, the previous structure having been lost to fire in 1999. Despite the its young age, the current structure, with its mossy thatched roof and authentic construction, manages to preserve the sense of historical presence that many other reconstructions in Japan fail to achieve, belied as they are by their obviously modern structures with only a bare façade of the original. This one, luckily, was well documented by a historical survey team, allowing it to be rebuilt much as it had been originally. One point that sets this temple apart from others extant in Japan is the fact that it sports a mixture of Buddhist and Shinto components. To be sure, this was certainly not rare at all throughout most of Japanese history: unlike European tradition, where religions were strictly separated and often antagonistic with each other, throughout most of Asia and especially in Japan, differing religions were embraced alongside each other, leading to mixed traditions, a practice academics call syncretism. In Japan, this meant that the native Shinto religion of nature worship (somewhat analogous to Paganism in Europe) blended with the already syncretic Buddhist traditions of China, which began being imported to the island country around 600 A.D. For the next millennium and a half, the two religions enjoyed a more or less peaceful symbiosis. This, however, came to an end in 1868, when the new Meiji government issued the Kami and Buddhas Separation Order (Shinbutsu Hanzenrei, 神仏判然令), forcing each religious institution to align specifically with one or the other in an attempt to isolate foreign culture from native culture. The result of this, ironically, was the destruction of a uniquely Japanese syncretic tradition. It seems, however, that some institutions managed to escape the order, the Bamboo Temple being the only one in the Tokyo area to do so. For this reason, anyone interested in Japanese religion ought to make a visit. 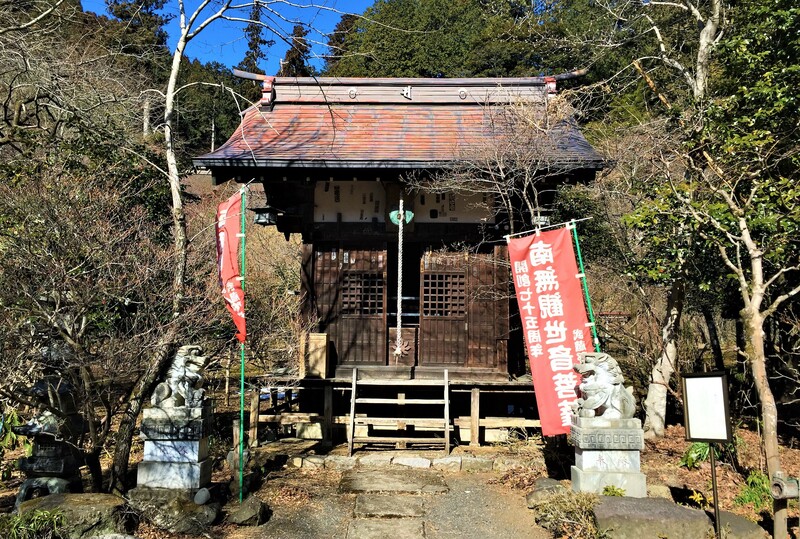 The syncretism is evident in the architecture of this temple: the Oxhead King’s Shrine sports a thatched roof, constructed in traditional Japanese style. A more typical construction in Buddhist temples is a roof made of dark ceramic tiles, a style imported from China. The patron deity of the temple, the Oxhead King, is a perfect representation of the syncretism that makes this temple so unique. The earliest form of the deity traces all the way back to India as the guardian deity of the Jetavana Monastery, one of the most famous Buddhist monasteries in that country. From there, his worship spread to China, where he became incorporated into Chinese Esoteric Buddhism, Daoism, and even Yin-Yang philosophy. Upon entering the archipelago, the character evolved even more, developing further within Yin-Yang thought while also becoming incorporated into various folk legends and even coming to be considered a manifestation of the male progenitor deity of Shintoism, Susa-no-Ono. Visitors to the temple today pray to him for advancement in society, protection from disaster, and relief from disease. At the Bamboo Temple, the Oxhead King and his eight sons are worshipped together, lending the temple its formal name of Eight Kings Temple (Hachioji, 八王寺); Bamboo Temple, as it turns out, is just a nickname arising from the forest of bamboo that surrounds the temple grounds. I heard that within the Sanctuary (kyûden, 宮殿) of Main Shrine is housed an image of the king surrounded by his sons, with an ax in his right hand and a rope in his left, but as I was told the sanctuary is only opened to the public once every twelve years, in the year of the Ox in the Chinese Zodiac. The next one is 2021, so if you happen to be in the Tokyo area then you should check it out. For those who have a more limited timetable, there’s also the yearly festival held on July 15th. The Oxhead King, with rope and ax in hand. Commonly called “umbrella pine” in English, this variety of evergreen native to Japan is known in Japanese as the highfield pine (kôya-maki, 高野槙), so named for it’s prevalence in highland areas across Kyushu, Shikoku, and Honshu south of Fukushima. The English name derives from the shape of its branches, which according to Japanese accounts forms an egg shape but apparently whoever gave it it’s English name thought it looked like a folded umbrella. Unfortunately, I failed to get a good picture of it as I didn’t recognize it’s significance until after I had already left. The highfield pine can be seen on the right. The Bamboo Temple’s pine can be found a little down the hill from the Oxhead King’s Shrine next to a long, low building that I think is probably the monks’ residence. This particular specimen is notable for two reasons. First of all, it’s quite old, estimated at somewhere around 400 years, and stands at a height of 26 meters, with a trunk circumference of 3.86 meters and a root circumference of 7.55 meters. The lower branches of this tree are a bit deformed, but it still maintains the species’ characteristic egg shape. It’s second claim to fame is the legend surrounding its origin. According to the story, this very tree was planted by Ôta Dôkan (太田 道灌), a famous samurai and later monk who is renowned for, among other things, founding the castle town that centuries later became the metropolis that is modern day Tokyo. Due to this story, the pine is also known as the Dôkan Maki. As you wander through the garden of the Bamboo Temple, a large, rusted iron bell hanging from a tripod might catch your eye — this is the Peace Bell, or Heiwa-no-Kane (平和の鐘). Forged from unused ordinance left by the American military in Baguio City in the Philippines in 1945, the conversion of these weapons of war into a work of art very literally symbolizes the transition from war to peace, and from enemies to allies. Baguio City resident and movie director Kidlat Tahimik brought the bell with him when he visited the ruins of Nagasaki and Hiroshima, praying for peace, and it was later enshrined here at the Takedera. The sign accompanying the work requests that visitors ring the bell for world peace. Avalokiteśvara in India, Guanyin in China, and Kannon in Japan, she is Buddhist deity of mercy, “[The One Who] Perceives the Sounds of the World.” One of the principle deities of Buddhist tradition, it’s quite common for temples in Japan to have one such hall on their premises. The Musashino area, through which this section of trail passes, contains a total of 313 such halls, and are organized numerically into a pilgrimage route, with the final stop being the Kannon Hall here at the Bamboo Temple. *Note that these are not officially designated camping locations but simply places that I judge would be nice to put down a tent. Camp at your own risk.